Don't judge its looks—check out how it cooks. When the unremarkable-looking Kenmore Elite 75232 gas range (MSRP $1,599.99) came into the labs wearing an all-white finish and a high MSRP, we weren't expecting anything special. However, much like the great racehorse Seabiscuit, who rose from underdog to champion, the 75232 vastly exceeded our expectations where it counted: The range handled our real-world baking tests with finesse, turning out beautiful cookies and cakes. Since the purpose of the oven is to cook food, this kind of high-quality result has earned the unassuming range our sincere recommendation. As far as the looks and the price are concerned, the identical 75233 mixes stainless and black trim, and retails for a more reasonable $1,259. A boring look, but it can cook! Definitely a weak point of the 75232, this range isn’t exactly a treat for the eyes. It’s nice to see a white range in a sea of stainless steel, but without any interesting details to pick it up, the 75232 falls visually flat. The contrast of stainless and black on the otherwise-identical 75233 is more to our liking—but it's up to you which finish you choose. If you just want something to match your white fridge, or seek function over form, this range should do just fine. 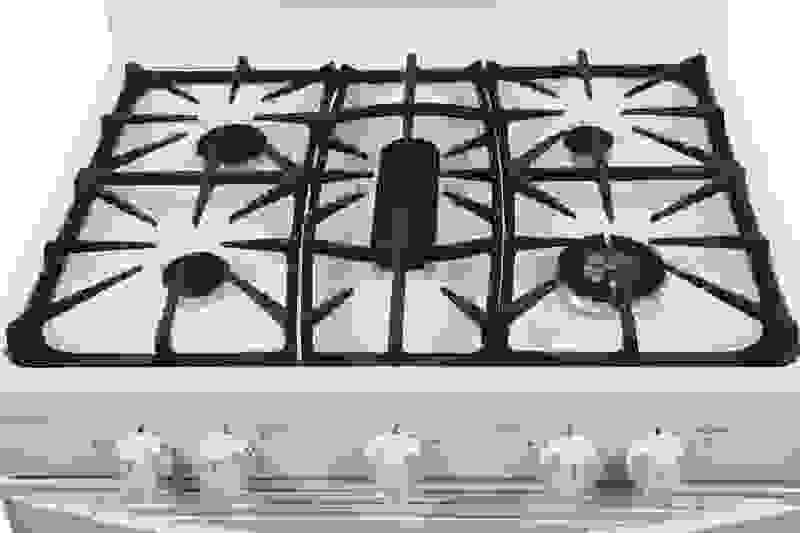 A continuous black grate covers five gas burners, which are controlled by knobs at the front of the range. Below, you’ll find a respectably sized 5.6 cubic foot oven cavity and a warming drawer. In terms of extra features, this range sticks to the basics. While it lacks dedicated bread proofing, pizza, and chicken nugget settings, it should have everything you need to comfortably prepare a meal. This rangetop performed as a gas range should. The two front burners, center burner, and left rear burner boiled water quickly, with the fastest burner boiling six cups of water in under five minutes, and the remaining three coming in around the ten-minute mark. We were unimpressed with the 406°F average maximum heat, but gas rangetops just don’t get as hot as electric or induction. On average, burners could reach a low temperature of 126ºF for simmering. The right rear simmer burner only reached 291°F, which explains why it was unable to boil water. Unfortunately, it also had trouble staying lit when we turned it down lower than the other burners. If you make your own sauces and soups, this rangetop may not be for you. We are lovin' this oven. This is a great oven, and the proof is in the pudding. Or rather, the cakes and cookies from our baking test. The cakes and cookies we baked in this oven were about as close to perfection as we could dare to hope for: Even browning all across the board, with no dark bottomed-cookies or mismatched cakes—now those are the kind of surprise results we like to see. We think this range is a pretty good deal—and up to cooking an excellent meal. It may not win any beauty contests, but this is a great range from the inside out. The rangetop wasn't great, but it performs reasonably—so long as you aren't boiling two things at once or cooking on low heat. The oven, on the other hand, is downright fantastic. 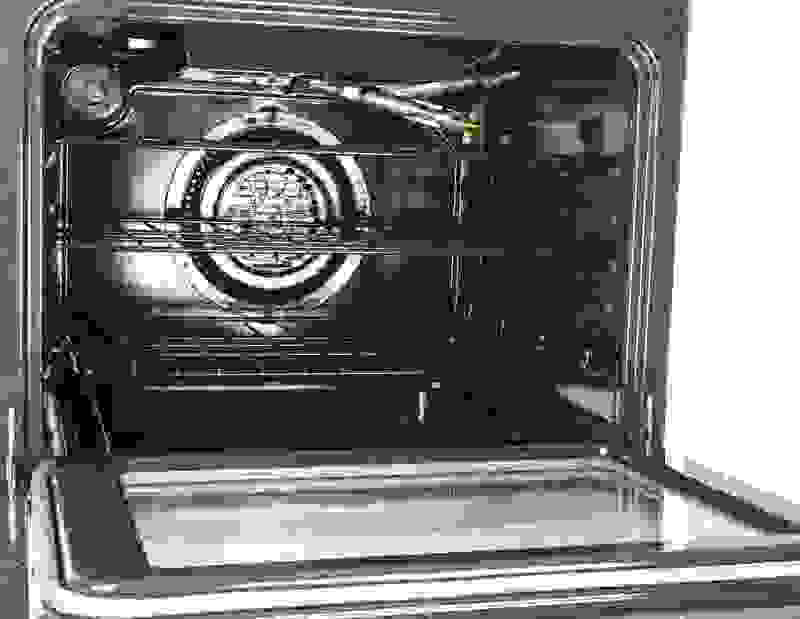 At the end of the day, all we want is an oven that can cook our food well and quickly, and this one is up for the task. Though the exterior is plain, we found sale prices as low as $1,099.99. In our opinion, that makes for an attractive range.